Lee Alexander McQueen was and will always be one of my favorite fashion designers because he constantly challenged the definition of beauty and always pushed the boundaries of art itself. As I've mentioned before on my blog, I think he was a true genius in the way he conveyed emotion with his pieces and how he chose to present them. No designer can ever replace him, for his vision was uniquely his own. 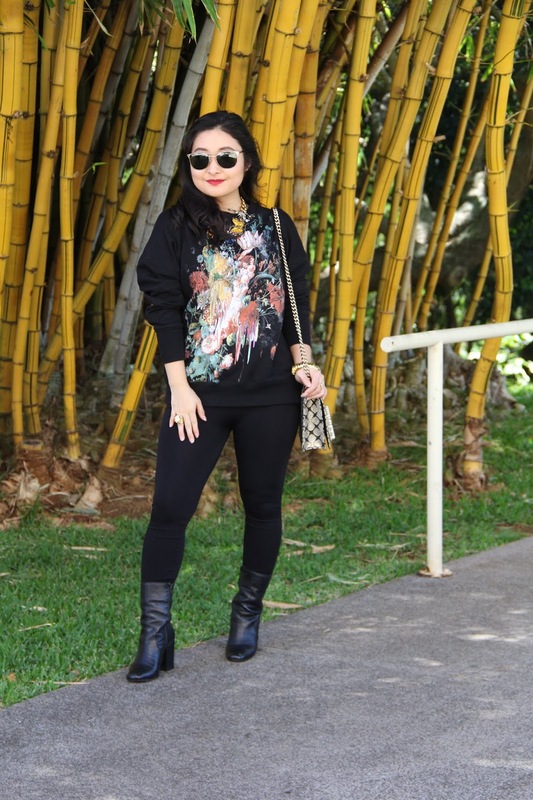 My dream is to one day own a wearable runway piece that he designed, but for now, I am happy to add this Alexander McQueen floral printed sweatshirt to my closet. Although this piece was designed by Alexander McQueen design team under the direction of Sarah Burton, I think this print captures the essence of Lee's love of finding beauty in everything. He once said, "I find beauty in the grotesque, like most artists." 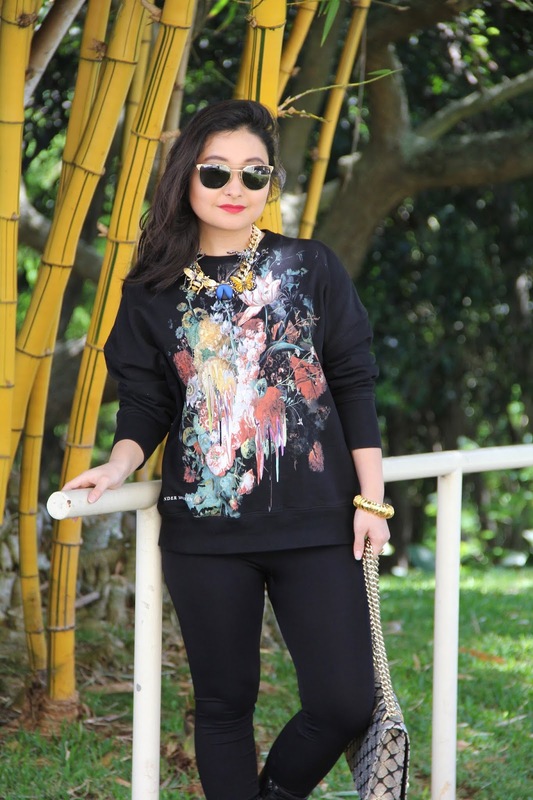 The painted flowers on this sweatshirt are stunning all on its own, but I love the fact that it looks as if someone splashed oil on the canvas in which it was painted, or as if the design is dripping down like candle wax. Personally, if I had a choice of wearing it with perfectly painted flowers or melted like this, I'd take the latter. There is raw beauty in imperfection; it's a lesson I am continuing to learn. 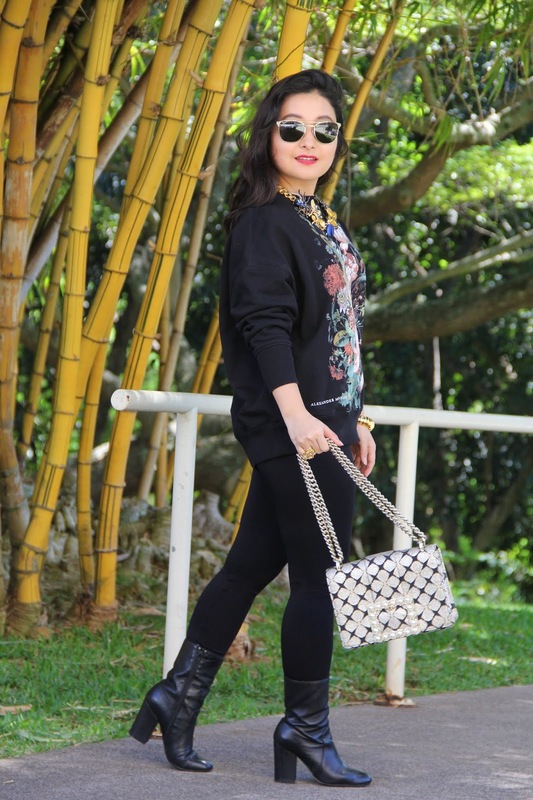 Getting back to the outfit itself- I chose to style this artsy sweatshirt with a simple pair of black leggings and a pair of boots for an elevated casual chic vibe. This sweatshirt makes a statement all on its own, but I selected a handful of accessories that could quite possibly steal the show. Take this chunky gold chain necklace, for example. I decorated it with a handful of insect pendants to create a bold and unique piece. 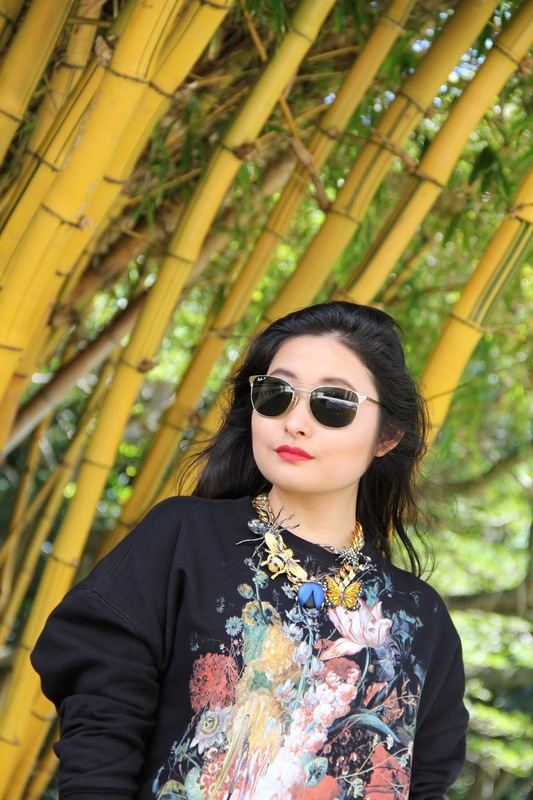 I usually like to pair statement necklaces with a less eye-catching top, but in this case, I love that the insect pins blend in with the design of the sweatshirt. Now, this look wouldn't be complete without a shiny gold purse! This Kate Spade handbag exudes luxury and opulence with the gold rhinestone-encrusted buckle and baroque design. Clashing prints and an over-abundance of gold may not be everyone's cup of tea, but I quite like the combo! 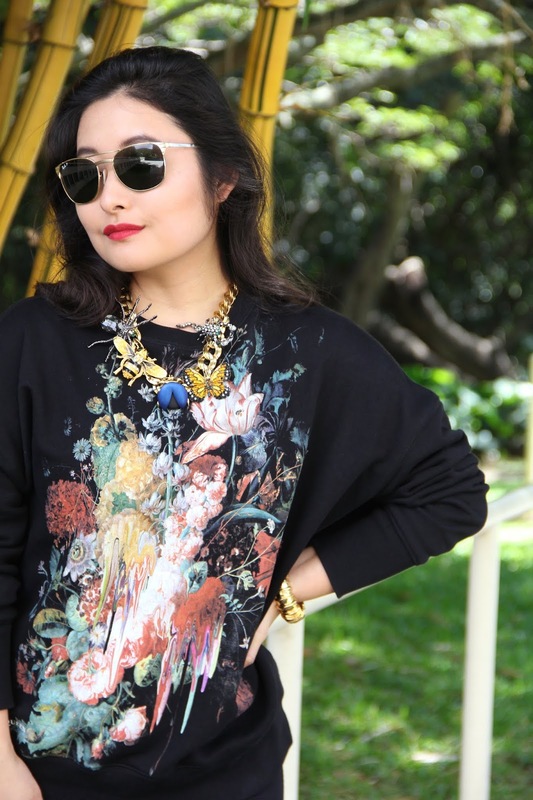 To finish off the outfit, I slipped on a pair of sunnies, a gold bangle, and stacked on a handful of gold rings. And there you go: the most over-the-top way to style your casual sweatshirt. Trust me, I do wear this outfit out quite a bit, but minus the long list of accessories. 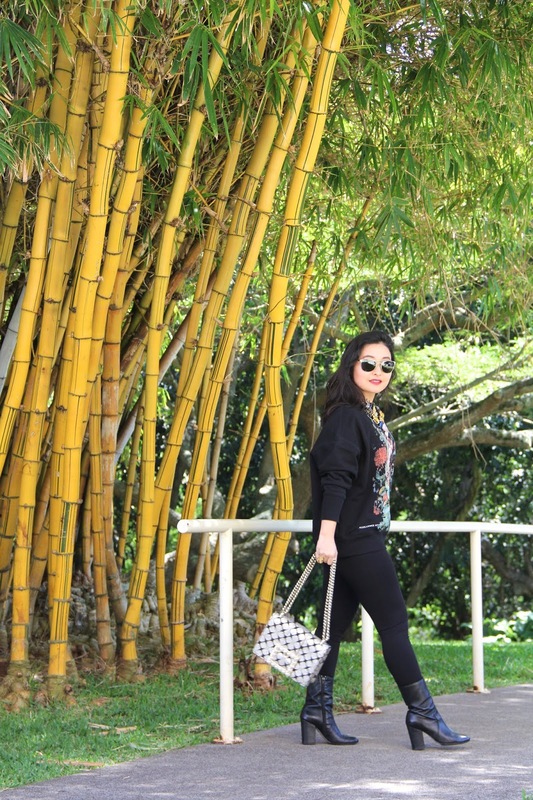 Just for the sake of this outfit post, you know I had to doll up this sweatshirt and leggings duo. Anyway, let me know in the comments below what you think about this outfit. I'd love to know! As always, I am sending you lots of love from my heart to yours!